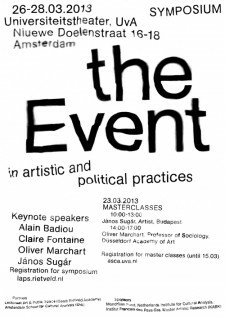 In contemporary artistic, media and philosophical discourses the notion of ‘event’ has gained considerable currency. Since the 1990s the event has been central to a range of performative, media-based, socially and politically engaged artists’ work, as well as in artists’ involvement in/with non-artistic projects and practices ranging from political protest to scientific research. The growth of interest towards the potentials of art openly working with reception and/or participation as its methods has also lead to institutional commissions for this type of artistic work. For the institutions event-based art has triggered entirely new questions about the documentation and preservation of artistic practices.